Standard Product is .019 Aluminum with a smooth baked enamel Finish (standard) or a PVC Coated (wood grain texture) Finish. 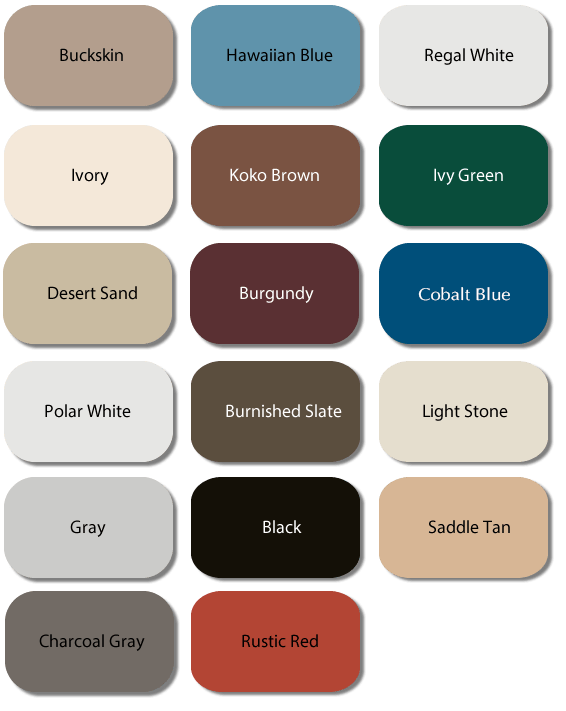 These colors come from the siding industry such as Alcoa/Mastic, Certainteed, Norandex, Rollex, Gentek, Edco, Crane, Variform, Napco and Wolverine. Should you need a heavier material for your project, you can choose from the other materials shown or call for other options. 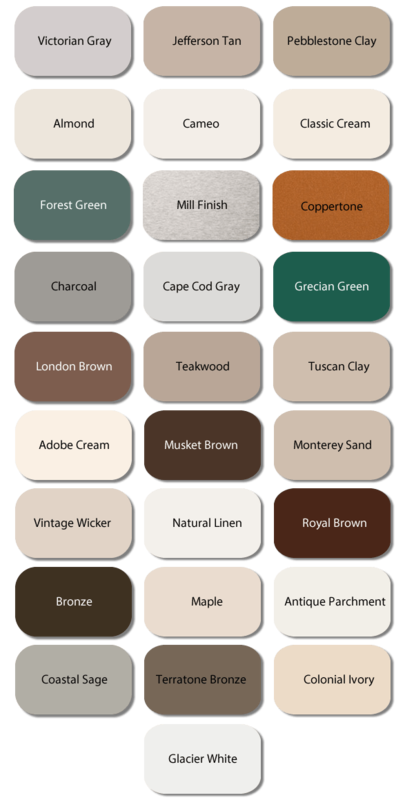 Charcoal Gray, Brandy Wine, Sierra Tan, Hemlock Green, Stone White, Terra Cotta, Dark Ivy, Regal Red, Clear Anodized, Royal Blue, Colonial Red, Silver Metallic, Almond, Extra Dark Bronze, Teal, Cityscape, Patina Green, Electric Blue, Champagne, Sherwood Green, Copper Tone, Tropical Patina, Hartford Green, Slate Gray & Sky Blue are all SPECIAL ORDER colors, allow additional time (2-3 weeks).